Driving into work this afternoon I noticed a young woman on a Vespa. Sitting in my 2000 Honda CRV with the air conditioning on, I couldn’t help but envy the woman on the small motorcycle, whipping through traffic, enjoying her own breeze in the 82 degree heat. That was me, back in the 80’s. Along with my 1976 Toyota Celica, I once owned a Suzuki FZ-50. Always being mistaken for a Moped, it was sturdier and didn’t have a pedal option. It was not unlike the Vespas you see so often now, except it could only seat one, and it could barely reach 35 mph. 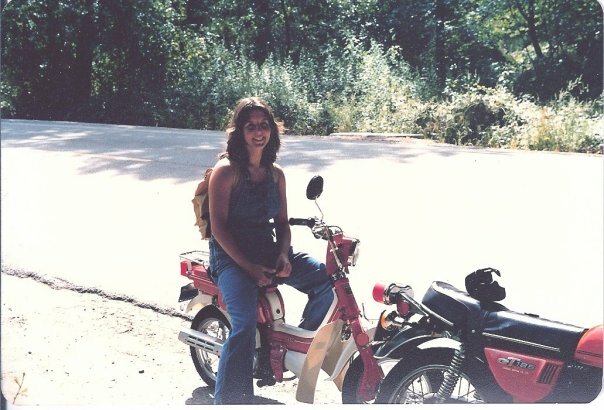 I was living with my boyfriend Dave in Antioch, California at the time I bought the scooter. He was a fan of Suzuki motorcycles — he had a small bike and a large one at the time. We took the bikes — my scooter and his smaller motorcycle — on a camping trip in the Santa Cruz Mountains around 1980. We had no tent; just his father’s pickup truck with a camper shell. Silly me, I remember bringing regular coffee, thinking it was instant. What was I thinking? In fact, “What was I thinking?” should be the title of that whole relationship. But that camping trip was fun, regardless. We took the bikes all around Santa Cruz; to the Boardwalk, around town and into the mountains. It got us out of Antioch for a few days, away from Dave’s parents (who were always coming by, unannounced, always checking up on their precious boy). Even more so, it got us out of our environment and our frustrated, somewhat stressful lives. We were two kids, basically, aged 19 and 20. We fought a lot; Dave had a violent temper and was always punching walls — even getting physical with me a couple times. 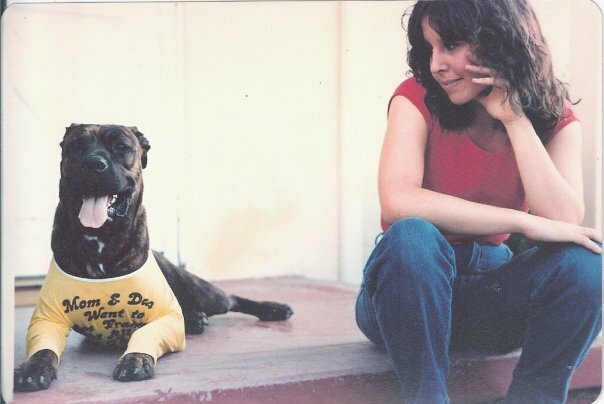 Dave’s dog Eddie, and me —1981. Having come from a dysfunctional family, I simply powered through the tumultuous relationship with Dave. I once fired a pellet gun at him; he kept one under the bed, for God knows what. One night we were arguing, and he, in a fit of rage, pounded on my legs while I was sitting up in bed. I tried to leave the room, but he stood by the bedroom door, blocking it. I took out the pellet gun and fired at him, purposely missing him, but leaving several marks on the wall and doorframe. 20 years old, and I’m firing a gun at my boyfriend?! He never hit or pushed me again after that, but even so, I knew I had to get off that ride, and get myself off to school to become a kid again. San Jose State University beckoned, and, on top of pursuing an education in Graphic Design and Advertising, it was my answer to getting out of a situation that might eventually get me killed. Once I moved to San Jose I got to hang out in Santa Cruz quite often, as it was just a 20 minute drive on Highway 17 up and over the hill. It was a nice escape from school, the busy-ness of San Jose itself, plus it was on the ocean, which I found intriguing. I made many trips on my own, sometimes having a coffee drink while listening to small bands playing at the (original) Cooper House at Pacific Garden Mall. 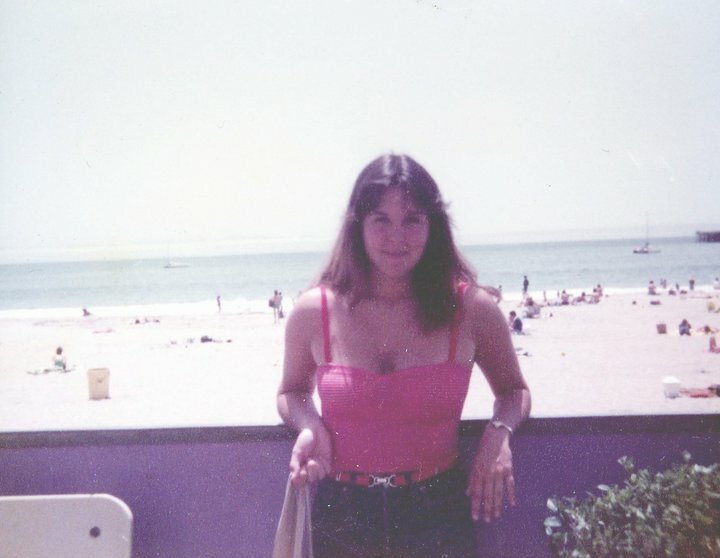 Me, at Santa Cruz Beach & Boardwalk, after moving to San Jose —1982. Back to the FZ-50, when I made my move to L.A. in 1985 I brought the scooter with me and probably rode it more in the next two years than in the four years I lived in San Jose. Once, while cruising down La Cienega Blvd. in West Hollywood a carload of guys were cheering and wolf-whistling at me. They wound up rear-end another vehicle. The Suzuki FZ-50 never got ridden after I got married. It sat in the garages of various homes of ours over the years, and back almost six years ago during our remodel, someone stole it. I was devastated. I had regrets about neglecting it all those years. My only solace was in hoping that whoever took it would clean it up and get it back to looking and functioning how it used to. Just the same, the scooter held memories for me, and still does. Perhaps that’s why I held onto it for so long, even in its neglected state. It represented a younger, wilder, more hopeful and carefree Kelly, even though at the time — especially 1980-81 — my life was flecked with confusion and inner upheaval. You are on an adventure right now, but there are many more to come. You will one day get to live in L.A.; you will marry an architect who will never hit you; you will live in a nice home in a cool neighborhood in San Diego; you won’t have children, but you will have pets, and they will be like children to you; you will have a career in Broadcasting; you will have many friends; you will travel; you will live a very full life. And that wind would be right.